It's almost two years now that Belgium tries to form a government without success. Even the previous government, with prime minister Leterme, was not fully baked and disintegrated quickly. Why is is so hard to make a government in Belgium? For each political family (basically one left, one center, one right) you have two parties: one Flemish an one French. This means you need 4 to 6 parties to make a government (this gets worse if you need a 2/3 majority). The linguistic split of the parties happened in the seventies. Originally these sister parties were closely linked. Making a government still fealt as dealing with the political family. Over the years they started to diverge. Nowadays, for example, the Christian center parties (CD&V and CDH) are very different and are no longer logical allies. You can not manage any business or a country well with so many different parties is nearly impossible. So while the focus in this crisis is on topics - basically regional resopsibilities and tackling debt - the problem is a structural one. Next time we will have a different topic, but we will always have the same complexity. Once you accept this as the problem, the possible solutions are clear. You need political parties that are scoped to the territory that is governed. Either you reunite the parties to match the country of you split the country to match the parties. The regional split of the parties is stimulated by the election system. Politicians for parliament are elected in provincial circles. This means that they do not have any interest in being popular in another region and that they benefit from defending the interests of that region. One of the proposals in current negotiations was to have some politicians elected in nation wide circles. This would surely bring political families closer again. The problems in Europe are not different from the problems in Belgium. Currently Europe is governed by representatives from each country, each defending his interest. If European political families do not unite and Europe is not governed through the representatives in parliament, Europe will disintegrate. 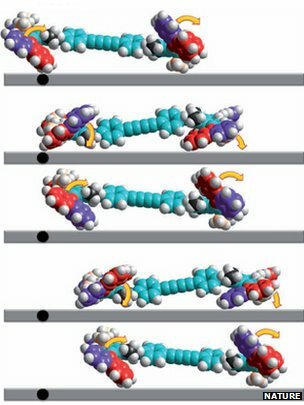 After the one molecule robot, an article in Nature now shows a one molecule car. Electron absorption make the wheels turn and drive the car. It only works under exotic lab conditions. With earth population hitting 7 billion, C02 emission rose 6% last year. The main sources of the emissions are China, India and the US. This is worse than the most pessimist scenario of the International Panel for Climate Control. This will be an impediment for producing enough food for the 7 billion of us, due to draught, storms and floods.